Casio Middle East has introduced the company's latest range of models for its Baby-G brand, which have been designed and developed for the active yet elegant and sophisticated women of today. The newest line of Baby-G watches, the G-MS range, exemplifies the successful integration of fashion and functionably demonstrating Casio's commitment to support women who are always on the go with timepieces that are bold, stylish, tough and chic. Koji Naka, the managing director, Casio Middle East, said the new G-MS models take on a design that can be worn during casual and more formal occasions. "The watches exhibit a classy feminine look utilizing generous portion of gold and pink, without sacrificing the functionality guaranteed with the use of metal for the face rings, band ring, and buckle, and the cool, metallic gear-like look, which is a perfect fit for adult women," he explained. “Today's women are completely different, placing stronger focus on their careers and interests. Despite this, women of today have expressed their preferences towards what is simple yet beautiful and what will make them unique,” said Naka. “In line with this, the new Baby-G G-MS line is also unique as it takes on a look that reflects what today's women are all about--adventurous, creative and ready to take on any challenge yet never sacrificing the sense of femininity, elegance and luxury. 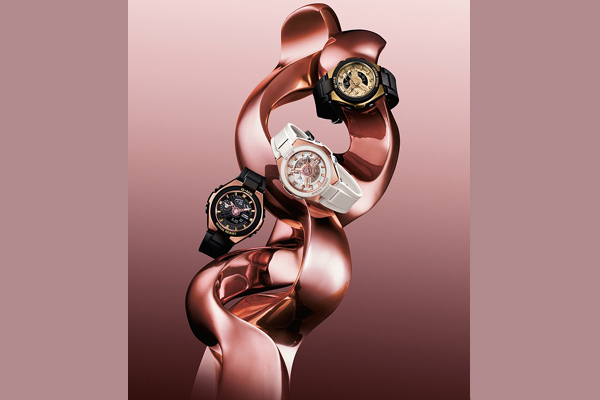 The features of this new range of watches fit modern women's needs with a look that is both classy and chic,” he stated. The latest shock-resistant G-MS models are presented with a 100-meter-water-resistance feature and comes in gold and pink hues that can complement any wardrobe and any occasion. These watches are offered in a sleek stainless-steel case packaging with sophisticated resin base material and band to give it a more fashionable feel and appearance that any active woman would love to wear, said Casio in its statement. In terms of functionality, the G-MS range is equipped with a LED light super illuminator with auto-light switch; a Dual Dial World Time, which shows the current time in another time zone using a small dial; and a regular timekeeping and a full auto-calendar enabling female travelers, adventurers, and entrepreneurs, among others, to keep track of many appointments wherever they are. Other key specifications offered by the new Casio Baby-G G-MS watches include resin band, neobrite, shock-resistance, mineral glass, 100-meter water resistance and a LED light super illuminator.